Magic models to make and colour in. 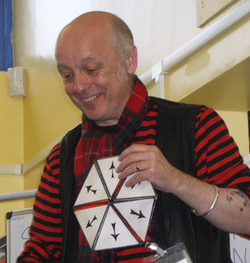 If you've seen me talking about my Murderous Maths books, I probably demonstrated some of my different FLEXAGONS. A flexagon looks like a piece of folded card which you can turn inside out. The good bit is that you're never quite sure what you'll see next. 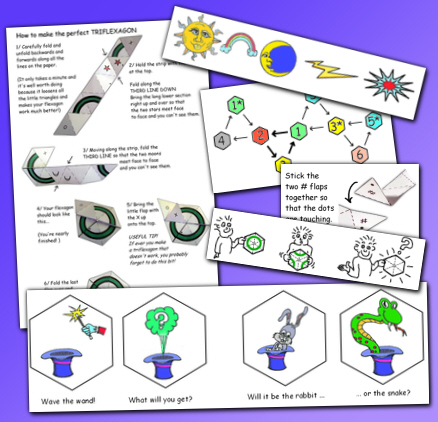 Many years ago I put instructions for making very simple flexagons on the Murderous Maths site, but now I've done a fully illustrated book that shows how to make all the flexagons on the video including the Prison Escape, the Magic Hat and the Treasure Chest Puzzle! There are also tips on folding and flipping, hints on designing your own flexagons, plus flexagon maps to help you find your way when you're playing with the tricky ones! Click the links below to view/download the book and templates as *PDF files. All the templates used in the book can be printed out here. Each template is two A4 pages, for the front and back of each flexagon. There are also a set of blank templates, plus a few extras for even more fun! Make sure the printer's paper guide isn't loose! Print the front first, then turn the paper over and re-insert it to print the back. Hold the finished sheet up to a light to check the images are aligned. Most printers will do this well enough, but if the pictures don't align, print the fronts and backs on separate sheets. Paste them together (with spray mount is best) then cut them out. Turn a small coin into a different coin (or even a button) with this strange tetraflexagon!